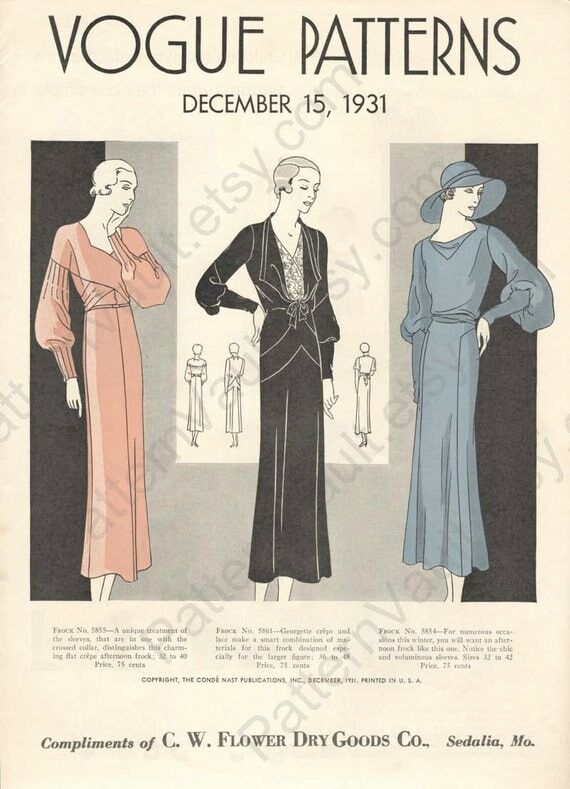 Vogue Patterns booklet, December 15, 1931. Image via PatternVault on Etsy. Today marks three years since my first post on this blog. To celebrate my blogiversary I’m throwing a giveaway: one lucky reader will win 5 instant downloads from the PatternVault Etsy shop. 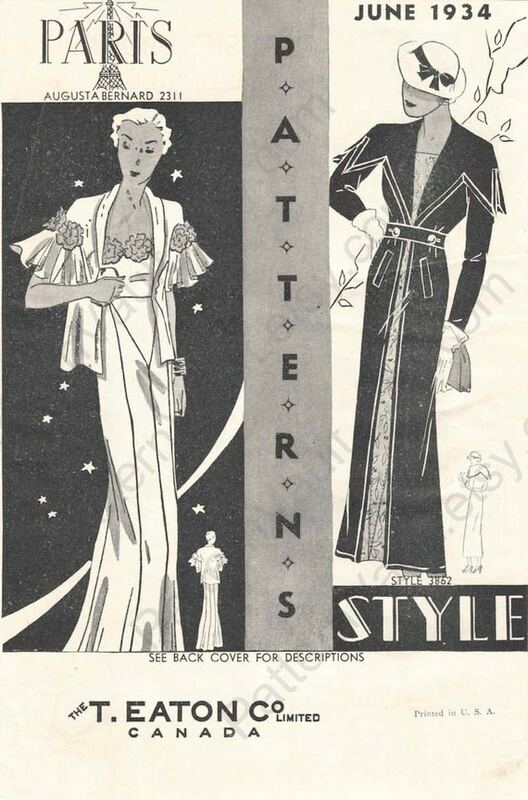 Paris and Style Patterns booklet, June 1934. Image via PatternVault on Etsy. To enter, leave a comment mentioning what you’d like to see more of on the blog. The giveaway closes Monday, July 14th at midnight EDT. The winner will be chosen at random and announced this Tuesday, July 15th. I would love to see some more of the earlier styles — but I love all of your posts that I’ve read so far! It’s very fun. Happy Blogiversary! And Many Happy Returns! I’m a fairly new follower and so am absolutely captivated by the wonderful patterns you share on your lovely blog and I enjoy the way you theme your posts. Thanks for the giveaway! I love pretty much all your content (so thanks for you time and efforts!) and would be excited to see more designs that are wearable – either vintage patterns that don’t scream vintage or designer patterns that aren’t too avante garde – patterns/images that could directly inspire a modern outfit. Vintage hat patterns! Thanks for asking. I love your blog as it is 🙂 Happy blogiversary! I love all of your posts as well. What else would I live to see? That’s a hard question as each blogger has their own niche and comfort zone. Maybe the things that interest me might be how to get the look that you post about with plus sized options. Maybe hairstyles and hats to get that vintage feel that is possible without the actual patterns. Or I would continue to follow you with other ideas as I am already sold on your niche! The older patterns had such gorgeous details. Is it possible to discuss how these decorative elements were created? I enjoy your posts immensely! Your say you are a recovering academic and it shows! This is one of the best researched and presented blogs on vintage sewing patterns there is. You take enormous trouble to investigate the pattern, the designer, the model and the original runway look – it just fascinates and enthrals me. I like the “non-judgemental”, cool, slightly professory style of your writing – the breathless “fabulous” “awesome” commentary is missing and you just present the clothes and the designs how they are. We don’t have to love or hate the look, rather seek to understand. So I like the historical analysis the best. Secondly I like the makes and the faithful way you photograph them. I don’t dislike the model section, or the free patterns, but they are less important for me. Actually I would like you to write the definitive book on the history of patterns but I suppose you are too busy for that. As everyone else has said you are just creating wonderful content and I love to read your findings. I like reading everything about fashion history. As many others have commented, I enjoy the diversity of your blog, so my suggestion really doesn’t imply that I would like to see less of other subjects. That said, I have really enjoyed your exploration of particular designers and their (sadly sometimes fleeting) association with Vogue patterns. Don’t mess with a great thing lol! I enjoy all that you do on your blog, it’s so informative and easy to read. Well done and I look forward to more great things to come. I love your topics as they are! I am personally inclined toward vintage patterns for slips, bras, and other undergarments and I am fascinated by the history surrounding those pieces. Congratulations on 3 years! Love the content, especially learning about the models on the patterns! Vintage hats, oh yesssss. I really appreciate the variety and the detail of information about pattern history, models. I stumbled in here about a year ago from an Alexander McQueen search and am always happy to see a new post. Happy anniversary indeed! Would love more vintage hats/patterns! I’d love to see more accessories as they are often what makes an outfit special. Congratulation on your anniversary! Happy Anniversary! I love your blog and always look forward to reading it and want more.. Reading about the history of fashion and pattern making is really inspiring. I also enjoy your blog. Would like some details about fabrics and textiles from selected eras. I have enjoyed the posts about the history of each designer’s patterns and the models. I truly enjoy your blog as I also write about vintage patterns and their unique details whenever I can. I love how you also investigate the models that posed for the covers, I would love to see what you can find on Louise Vyent, one of my favorites from the 1980-90s. Happy, happy! I don’t think you have yet covered my favorite designer, Geoffrey Beene. I love your designer retrospectives and read them eagerly whenever they pop up. Congrats on a well-researched, erudite blog. Have just stumbled back into your blog and find it fascinating. Got to agree with Karen, I’d love to know more about the fabrics. Oh, heck, I just want you to keep documenting anything you can about sewing patterns and their history. I’ve learned so much from you. Happy Blogiversary! Your blog is great just as it is – but as an *ahem* larger lady for whom vintage fitting is just a dream I particularly like to see accessories, but the designer histories are fab. I’m a new follower, so I’m not entirely sure, but I do love all the links to free designer patterns! I just found your blog through this giveaway on Wow I Like That, and I am so glad that I did. I am very interested in historical dressmaking and am looking forward to reading more here. Happy birthday! I like everything you do, though I especially like it when you do posts on particular designers, so more of those would be nice! Darn, I missed this! Happy blogging birthday!